What is the justgetflux.com cookie? I've been noticing a justgetflux.com cookie that appears in Safari (6.1.6) occasionally. Here is a screenshot: https://i.imgur.com/9oIwdIm.png . I'm on Mac OS 10.7.5. I have F.lux 36.5. What is this cookie and why is it stored in the browser? Also, why is it viewable in Safari, but not listed on Firefox (46.0.1)? I do not visit the justgetflux.com site and I don't use Safari for browsing. If this is a preference that stores sunrise/sunset information, 1. Shouldn't that be stored in the flux program? 2. Couldn't I simply set a timezone/sunrise/sunset manually? Deleting the cookie doesn't seem to have any adverse effect. To add a little more info, I very much prefer programs to let me know when they are connecting to the internet and storing information on my computer. I want to know what they are doing. I've been very pleased with F.lux for years now and I'm not suspicious of the program, per se. I wanted to find out this info and provide my feedback, though. Thanks, of course, for a very helpful program! Our updater checks for updates using Sparkle, which shares cookies with Safari. Our web server sets this cookie to figure out how unique people are using f.lux. It doesn't identify you personally. What we use it for: our analytics software can tell us if everyone on a particular OS stops using f.lux (so we can see problems as they happen). Also, by knowing how many "unique" users there are, we can plan for bandwidth for updates, prioritize different platforms/languages/etc. It's the usual stuff. Thanks very much for the explanation. If it's not asking for too much detail, what does "...how unique people are using f.lux" mean? Does the cookie track user actions or f.lux software actions (number of "starts" or user settings)? If the latter, why would this information be stored on the user's computer as opposed to on your servers? If the former, and the cookie is tracking web surfing, that is a little dubious. 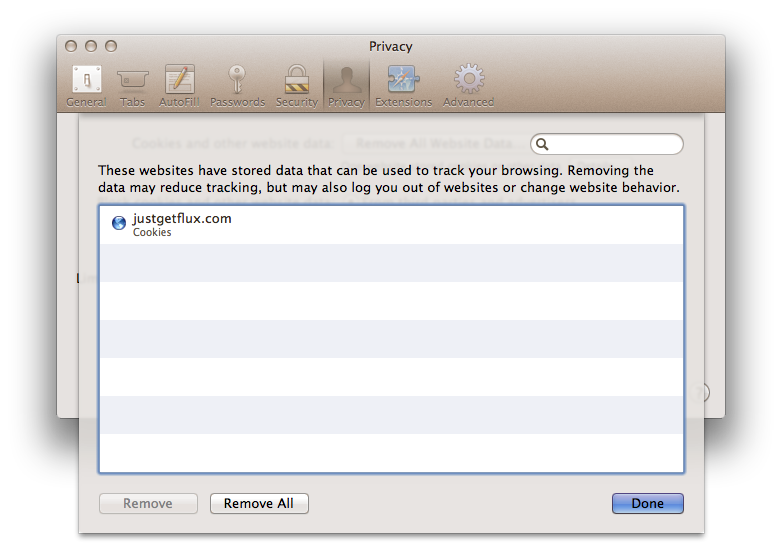 (Of course numerous websites track user web actions, but f.lux is not a web program.) Maybe we, in the community, would like to discuss this more. It may well be that f.lux is simply doing what you elucidate (noting if users on an OS no longer start f.lux[?] and storing number of unique users); those things seem unproblematic. But I wonder why the f.lux updater wouldn't send that information to store on your server, rather than storing it in a cookie. That's the reason I am following up. Cookies on the client lets us see the difference between 7 people who run the app once a week (or turn off their laptop except on Saturday) and 1 person who uses it every day. Can't do that on a server alone.